I hate asking someone for help and hate even more showing my ignorance so I ordered a booklet to learn how to use my new cell phone. Verizon doesn't provide them with a new phone, they tell you to just go on line if you have questions. Of course my first question is "how do I go on line?". Well, I sent for a booklet from the manufacturer(Samsung, they were great to deal with) and all I can say is I hope it's a King James version because it has enough pages to be something left in a seedy motel room by the Gideons. Still trying to get pictures out of the phone and into someplace useful. !&*@%+#!! Guys check out the free Dropbox app for Android and I-Phones. You load the app on your cell phone and on your PC, laptop or Mac. Your photos from your phone magically show up on your computer without use of any cables. lots of other uses but that was what I was mainly looking for, The free app does not offer a lot of gigs for storage but you can move your photos to a document folder on you computer and delete them from your phone and Dropbox folder on your computer to keep space available. Or pay a monthly fee for more space which is not really necessary in most cases. No affilliation (sp) in any way shape or form. SL Nugget - smart suggestion. I have been using DropBox for a couple of years and it is indispensable now. you want to put on there. on your computer, put it in DropBox and you can open it on your Smartphone. One of the best and smartest apps out there. Thank you SLN, didn't know that was out there! Desktop and phone... done, and done! As I posted on another subject on the forum there are some talented people on this forum! SL Nugget , AKA STAN is one of them. If it is GPS , phones or race cars (NASCAR) just among a few he is one to ask, not to mention Kayak Fishing?? Kayak Fishing? ... Who does kayak fishing? I have been looking for a kayak fishing partner out west here for a couple years. 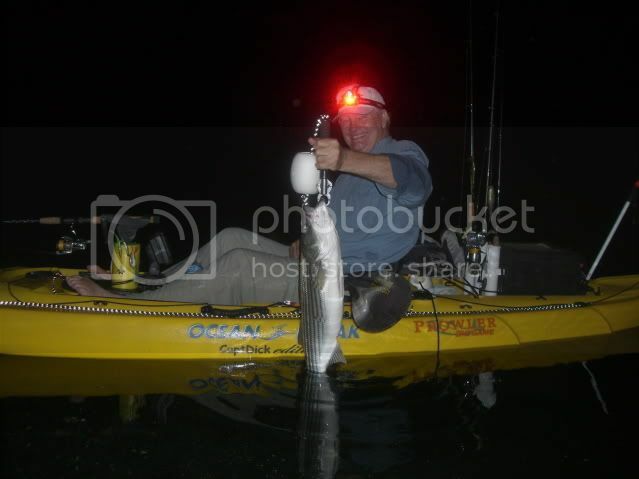 I have been kayak fishing for about 5 years now ... go back east each year to fish stripers in the ocean off NH and MA coast and enter a kayak only Largemouth Bass tourney on Pawtuckaway Lake in Nottingham NH. I just sold my Ocean Kayak Trident Angler to buy a new model from Native Kayak ... a Slayer Angler 14. A little heavy but a very stable platform on rough water. Kyak fishing?? Are thy good to eat? Is there a size limit? Do you have to scale them. Try Bucks Lake Plumas Co. Ca. there are some monster Mackinaw there. It would be a hoot to get towed around for a while. Not the salt but Lake Lanier GA. For salt I usually went to the Gulf Of Mexico for Redfish, Speckled Trout and Tarpon. I have not paddled for a few years due to a shoulder injury. I do miss it. That a nice stripper Stan!! That is a nice stripper Stan, they grow them that big on Sam Rayburn lake in east TX, I hung one once, he tore my spinning rig all to pieces before he got away! What did he weigh? how far did he tow you? Way to go Stan ... I love the rush of the tow from a big ole momma stripper ... you can't fight them from the kayak, you have to tire them out ... BUT ... you can slow them down faster by turning the boat side ways, hanging your feet over the side toward the fish and lean back to the far side to balance the ride. Lots of fun ... for those who haven't had the experience you are missing a real thrill! Mind you this was the same Guy that Put his CHops on the Fishing Ticket at camp and when I got to the other side of the lake Now here I'm Getting Pissed Off. When I did get back to camp he put his Chops on my ticket one more time This Guy was a Retard. I could have kept them fish Alive for more then Three days and had Fresh Fish. After he Stressed them out they only lasted the day. And they tought Enjoy your Great Out Doors, Go Fishing?